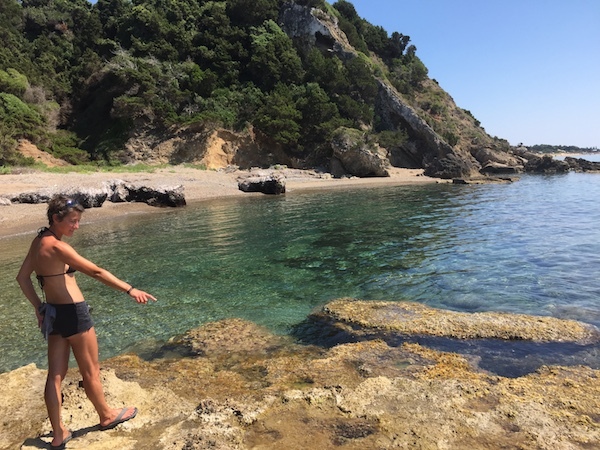 Having enjoyed two wonderful, relatively sedate days; jogging on the beach each morning, strolling to various beach bars, exploring the lazy lanes up to the nearby Kastro castle and taking a dip every now and then to cool down, it was time for something a little more adventurous. We walked to the very end of our long sandy beach, which at first glance looked like the end of the walk, we found that there was a way, albeit clambering, through the big boulders to the next couple of bays. The explorer in us then kicked in, what if it was possible to walk all the way to Kilini (the ferry port town about 10km north) along this rugged coastline? So next day we donned our walking shoes, filled our bladder packs with water and set off along the sandy beach at quite a different pace to everyone else spread-eagled under their umbrellas. Passing our speedo clad camper neighbours on their morning stroll, ‘Kalimera’ (good morning)! we chimed as we romped past, ‘Kalimera? !,’ they replied with a questioning lilt of their heads. It was only half an hour ago they had put their thumbs up as we returned, hot and panting, from our morning run during their breakfast. I guess they were wondering what we were up to now. Following these marks we made great progress from one secluded beach to another, clearly only accessible from the road via intermittent dirt tracks and local knowledge but probably way easier than clambering over the rocks. The red marks disappeared and a long sandy beach stretched out in front of us, at the end all we could see was a tall, rugged rock face. We trudged on, optimistic we would find a way past, our legs were regretting our morning jog on the beach as they worked to make progress in the deep pebbles. Finally we reached the end of and the tall rock face that blocked our way. We were so pleased to find that probably that, probably, same intrepid, kind soul had rigged up a knotted rope dangling down from the top. We pulled to test it, all good and scrambled up and over to the yet another long empty beach. Though our legs didn’t like it, we therefore took option three. 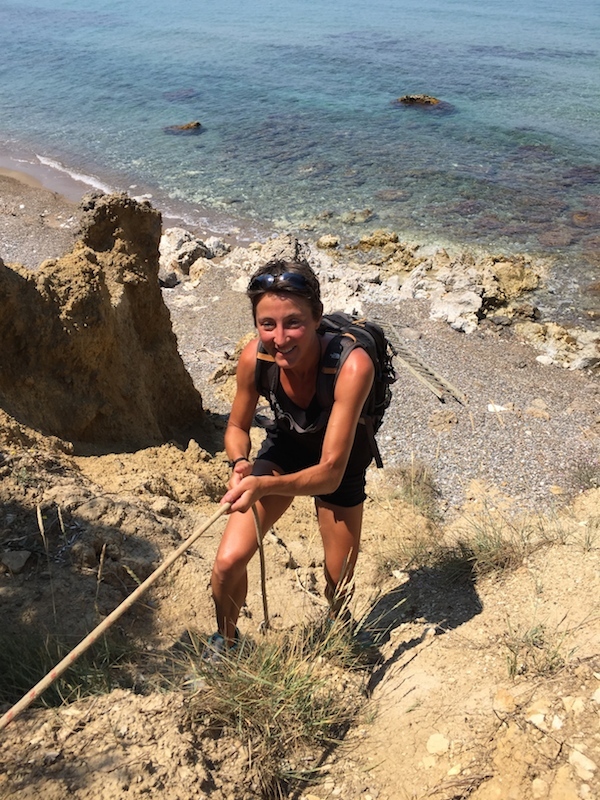 Trudging back down the beach of pebbles, clambering back over the tall rock and easing back down the rope on the other side back the length of the long sandy beach a mile or so, we found a dirt track and a little further on a narrow tarmac track. Of course we should take the tarmac track, with no map and in the heat of the day however frustrated that our adventure had been curtailed by the dogs and still determined to get to Kilini, we decided to set off up the dirt track which seemed to head more in the direction we wanted to go. After a few hundred metres, the track split. What now? With nothing but wise old olive trees to guide us, we went right. Just a short way around the corner we spotted a man with few teeth piling water melons onto his moped. 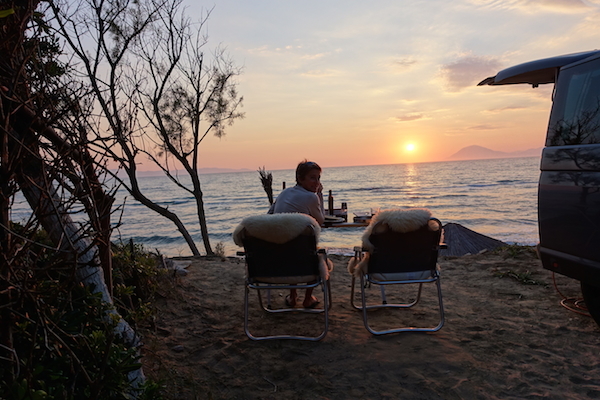 “Kalimera”, we said then making lots of scarecrow-like gestures, tried to ask which way to Kilini. After realising we spoke no Greek, he too resorted to a scarecrow poses and with a toothless smile, pointed to Kilini with one arm and Kastro with the other, of course completely the opposite to what our guidance system had assumed. We turned back yet again. The track seemed to be never ending, our stomachs were calling lunchtime and our shoulders reddened beneath a glaze of sweat. We stopped and switched to t-shirts. Another climb brought us to the main road at the top of a hill where we could see Kilini in the distance. We could also see the extent of the headland that we had considered swimming around and realised that swimming was absolutely not the right thing to do. The dogs had probably saved us as it was much further around the coast to Kilini than we had a assumed. Finally we reached Kalini after 5 hours just in time for siesta! All of the shops and restaurants appeared shut but around the corner a large sandy beach stretched alongside the harbour and, behind it, several restaurants touted for our business each with a couple of customers. We have never been quite so pleased to see tourists. Every restaurant in every place we visited in Greece so far has been the same, you can see the concern in the eyes and bodies of everyone as they welcome us warmly and always thank us for coming. Emotionally and very full, we thanked him, wished him luck for the season and set off to retrace our steps down the dirt track and along the beach, back to the campsite. 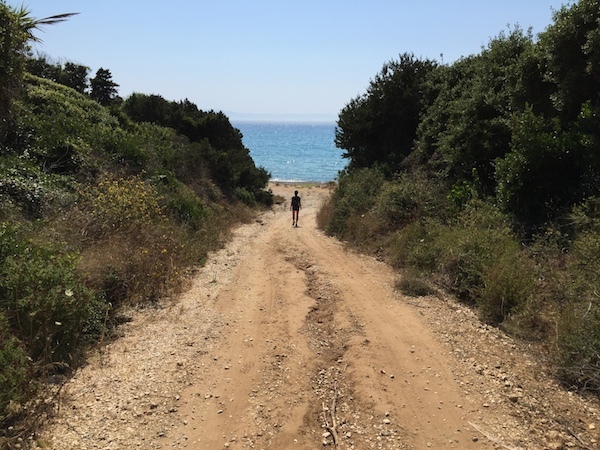 Our legs and mood were very light as we followed the red dots, clambered back through the last boulders and ‘out of the wardrobe’, onto the sandy beach, landing next to a startled family building a sand castle. 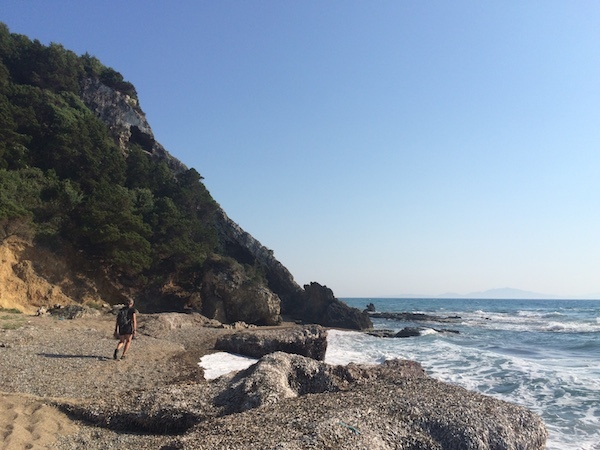 Another great little adventure, an off the beaten track Greek coast walk and a day of exploring just as we like it.